Dr. Megan Caldwell has been practicing small animal and emergency medicine in Madison for the past 17 years. A native of Madison, she attended the University of Wisconsin School of Veterinary Medicine, where she and partner Dr. Lisa Olson, graduated in 1999. 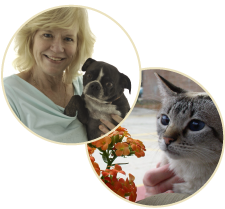 In 2007 the classmates set out to together with the a vision that would become Whole Pet Veterinary Clinic; the clinic they created was founded upon a goal of providing options for pets and their people that include the best of traditional and alternative medical care. Outside of this concept they knew that excellent customer service and attention to financial considerations with owners would be key to their business. While her formal training is in Western Medicine, Megan has a strong interest in Eastern modalities, and offers a range of natural and holistic healing options for her dog and cat patients. These include nutritional support, nutraceutical supplementation, and options for acupuncture and spinal manipulation treatments; she has used complementary modalities successfully to treat conditions including chronic ear infections, arthritis, intervertebral disc disease, allergies, seizures, inflammatory bowel disease, and behavioral problems. Dr. Caldwell aims to maintain the health of all body systems by placing the strongest initial focus on the GI tract. Special areas of veterinary interest include wellness care, dental care, internal medicine, geriatric health and soft tissue surgery. Dr. Caldwell is an active member of the Dane County Humane Society; she has volunteered with their community spay/neuter program, and has taught summer workshops for kids in DCHS's "Camp Paw Print". She is also a member of various veterinary medical associations including AVMA, WVMA, DCVMA, and volunteers her time for homeless animals from various breed rescues. When Dr. Caldwell is not gleefully busy at work, she likes to read, cook, be outdoors, and spend as much time as possible with her family. Her husband Bob and their 4 kids share their home with 5 fabulous cats and 2 cool canines.